If you die without leaving a Will you are said to have died Intestate, and your Estate will be distributed in accordance with the Intestacy Rules. The Intestacy Rules are a set of strict legal rules which dictate who will benefit from your Estate, how much they receive and who can administer your Estate. New rules were introduced on 1st October 2014. What happens to married partners or civil partners? If you are married or in a civil partnership and your estate is below £250,000, your spouse or civil partner will receive all of your Estate. half of the remaining estate – with the other half going to the children or grandchildren or great grandchildren at the age of eighteen years. If you are married or in a civil partnership and have no children or remoter issue then even if you have surviving parents or siblings your spouse or civil partner will receive the whole estate. Your parents and siblings receive nothing. 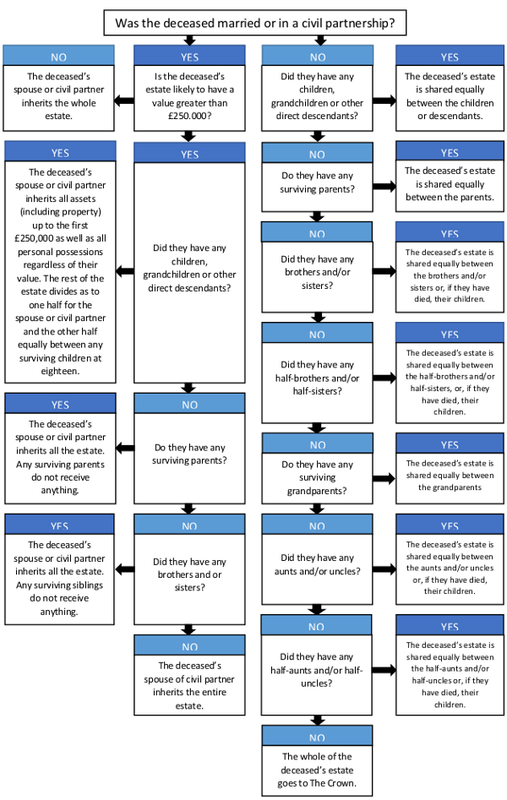 What happens to children under the Intestacy Rules if there is no surviving partner or civil partner? Children will receive all of your estate equally. If you have children from different marriages or partners they all will inherit equally. What happens to children under the Intestacy Rules if there is a surviving partner or civil partner? If your Estate is below £250,000 your children will receive nothing. Children will only receive an inheritance if your estate is valued above £250,000. One half of the estate above £250,000 is divided equally between your children. The other half passes to the surviving partner or civil partner. Children only receive your Estate if they are aged 18 and over on your death – unless they marry or enter into a civil partnership before they are 18. Until your children are 18 your Estate will be looked after by Trustees. Adopted children are recognised under the Intestacy Rules. Stepchildren are not included under the Intestacy Rules. If there is no one to receive your estate then the Crown will be your beneficiary. The Treasury Solicitor – based in London – will administer your Estate. Who administers your estate under the Intestacy Rules? There may be occasions when 2 administrators are needed – for instance if there are minor children or a life interest. 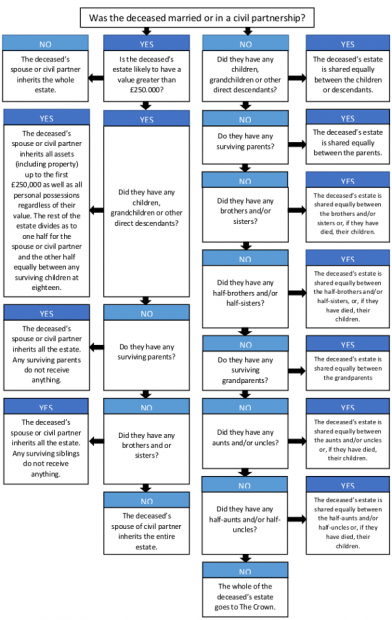 How do the Intestacy Rules apply where there is a will ? Even if you have made a Will there are, unfortunately, occasions when major mistakes mean your Will is not valid and the Intestacy Rules apply. You signed the Will one day and your witnesses signed the next or vice versa. Your relatives do not like your Will so destroy it. What are the problems with the Intestacy Rules? The rules were first introduced in an Act of Parliament dated 1925 and are no longer relevant today. If you are living together your partner is not recognised under the rules. The financial limits may mean your spouse or civil partner does not receive all of your Estate. Step children are not included in the rules. If there is no Will, your family have to prepare a family tree to show who is entitled to receive your Estate. Again this can take time and cost money. If your family do no know whether you have made a Will they may spend time and money in trying to search with all local solicitors to locate one. This will delay the administration of your Estate. The Intestacy Rules may not meet your family circumstances or wishes. If you do not make a Will you are relying on the rules to determine who your beneficiaries are. You may think your children are too young at 18 to receive any large sums of money. You cannot appoint Guardians to look after your infant children. You cannot appoint the people you want to carry out your wishes and see that the administration of your estate is carried out effectively. You cannot exclude members of your family. At MACKS we strongly recommend a face-to-face meeting in one of our offices or in your own home and at a time to suit you. This can be outside normal office hours if needs be. One of our specialist Solicitors will be able to explain things in greater detail and advise you how to avoid the intestacy rules and have a bespoke Will to meet your specific wishes, circumstances and family.